Recently our congress has talked about a 90% "punitive" tax rate on the bonuses received by some AIG employees. 90% tax rate seems absurd. 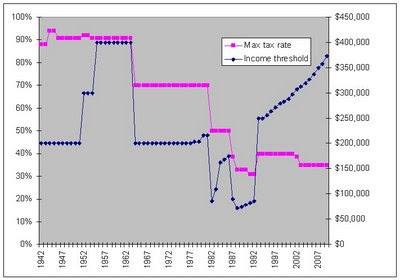 But did you know that as recent as 50 years ago we had a 91% tax bracket for high income levels? Our current maximum tax rates of 35% seems high now but imagine paying 91% marginal taxes. Before you blow a gasket over the thought of paying 91% of your income to the IRS, realize that that bracket only applied to the top amount of income. And at the time the bracket started at $200,000 when typical median income was less than $5000. But its still a very high tax rate even if it just applies to the very rich. So very few people actually paid such high tax rates. The Tax Foundation has a document with a history of all the income tax rates from 1913 to 2009. 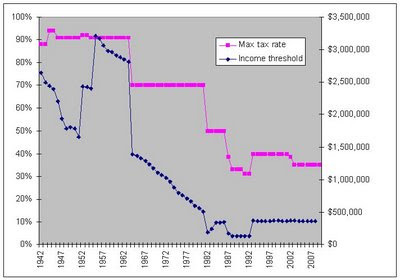 As you can see, the maximum tax rate has been decreasing in steps over the decades. 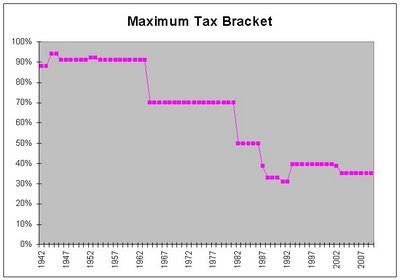 Now keep in mind that these maximum tax brackets were only paid on the highest margin of taxes. This would generally only include the top 1-2% of tax filers. But while the max rate changed over years the income thresholds also changed. We can also look at the maximum tax rate versus the income level that it applies to. For this kind of information to make more sense we'd have to adjust the income levels to current values. Looking at the previous table you can see that in 1957 the highest tax bracket was 91% on people making over $400,000. But that $400,000 in 1957 dollars equates to about $3 million in 2008 dollars. In the past 20 years the maximum rates have and the income levels they apply to have been relatively flat. The maximum rates have been in the 30-40% range and applied to income levels equivalent to over $300,000 levels.